This invention features permeability enhancer molecules, and methods, to increase membrane permeability of various molecules, such as nucleic acids, polynucleotides, oligonucleotides, enzymatic nucleic acid molecules, antisense nucleic acid molecules, 2-5A antisense chimeras, triplex forming oligonucleotides, decoy RNAs, dsRNAs, siRNAs, aptamers, or antisense nucleic acids containing nucleic acid cleaving chemical groups, peptides, polypeptides, proteins, carbohydrates, steroids, metals and small molecules, thereby facilitating cellular uptake of such molecules. This patent application is a continuation of Beigelman et al., U.S. Ser. No. 09/120,520, filed Jul. 21, 1998, entitled “NOVEL COMPOSITIONS FOR THE DELIVERY OF NEGATIVELY CHARGED MOLECULES”, which claims priority from Beigelman et al., U.S. Ser. No. (60/053,517), filed Jul. 23, 1997, entitled “NOVEL COMPOSITIONS FOR THE DELIVERY OF NEGATIVELY CHARGED MOLECULES” and Beigelman et al., U.S. Ser. No. (60/072,967), filed Jan. 29, 1998, entitled “NOVEL COMPOSITIONS FOR THE DELIVERY OF NEGATIVELY CHARGED MOLECULES”. These applications are hereby incorporated by reference herein in their entirety including the drawings. Trafficking of large, charged molecules into living cells is highly restricted by the complex membrane systems of the cell. Specific transporters allow the selective entry of nutrients or regulatory molecules, while excluding most exogenous molecules such as nucleic acids and proteins. The two major strategies for improving the transport of foreign nucleic acids into cells are the use of viral vectors or cationic lipids and related cytofectins. Viral vectors can be used to transfer genes efficiently into some cell types, but they cannot be used to introduce chemically synthesized molecules into cells. An alternative approach is to use delivery formulations incorporating cationic lipids, which interact with nucleic acids through one end and lipids or membrane systems through another (for a review see Felgner, 1990,  Advanced Drug Delivery Reviews, 5,162-187; Feigner 1993, J. Liposome Res., 3,3-16). Synthetic nucleic acids as well as plasmids may be delivered using the cytofectins, although their utility is often limited by cell-type specificity, requirement for low serum during transfection, and toxicity. Since the first description of liposomes in 1965, by Bangham ( J. Mol. Biol. 13, 238-252), there has been a sustained interest and effort in the area of developing lipid-based carrier systems for the delivery of pharmaceutically active compounds. Liposomes are attractive drug carriers since they protect biological molecules from degradation while improving their cellular uptake. One of the most commonly used classes of liposomes formulations for delivering polyanions (e.g., DNA) are those that contain cationic lipids. Lipid aggregates can be formed with macromolecules using cationic lipids alone or including other lipids and amphiphiles such as phosphatidylethanolamine. It is well known in the art that both the composition of the lipid formulation as well as its method of preparation have effect on the structure and size of the resultant anionic macromolecule-cationic lipid aggregate. These factors can be modulated to optimize delivery of polyanions to specific cell types in vitro and in vivo. The use of cationic lipids for cellular delivery of biopolymers have several advantages. The encapsulation of anionic compounds using cationic lipids is essentially quantitative due to electrostatic interaction. In addition, it is believed that the cationic lipids interact with the negatively charged cell membranes initiating cellular membrane transport (Akhtar et al., 1992,  Trends Cell Bio., 2, 139; Xu et al., 1996, Biochemistry 35, 5616). The transmembrane movement of negatively charged molecules such as nucleic acids may therefore be markedly improved by coadministration with cationic lipids or other permeability enhancers (Bennett et al., 1992  Mol. Pharmacol., 41, 1023-33; Capaccioli et al., 1993, BBRC, 197,818-25; Ramila et al., 1993 J. Biol. Chem., 268,16087-16090; Stewar et al., 1992, Human Gene Therapy, 3, 267-275). Since the introduction of the cationic lipid DOTMA and its liposomal formulation Lipofectin® (Felgner et al., 1987, PNAS 84, 7413-7417; Eppstein et al., U.S. Pat. No. 4,897,355), a number of other lipid-based delivery agents have been described primarily for transfecting mammalian cells with plasmids or antisense molecules (Rose, U.S. Pat. No. 5,279,833; Eppand et al. U.S. Pat. No. 5,283,185; Gebeyehu et al., U.S. Pat. No. 5,334,761; Nantz et al., U.S. Pat. No. 5,527,928; Bailey et al., U.S. Pat. No. 5,552,155; Jesse, U.S. Pat. No. 5,578,475). However, each formulation is of limited utility because it can deliver plasmids into some but not all cell types, usually in the absence of serum (Bailey et al., 1997, Biochemistry, 36, 1628). Concentrations (charge and/or mass ratios) that are suitable for plasmid delivery (˜5,000 to 10,000 bases in size) are generally not effective for oligonucleotides such as synthetic ribozymes or antisense molecules (˜10 to 50 bases). Also, recent studies indicate that optimal delivery conditions for antisense oligonucleotides and ribozymes are different, even in the same cell type. However, the number of available delivery vehicles that may be utilized in the screening procedure is highly limited, and there continues to be a need to develop transporters that can enhance nucleic acid entry into many types of cells. Wagner et al., 1991,  Proc. Nat. Acad. Sci. USA 88, 4255; Cotten et al., 1990, Proc. Nat. Acad. Sci. USA 87, 4033; Zenke et al., 1990, Proc. Nat. Acad. Sci. USA 87, 3655; and Wagner et al., 1990, Proc. Nat. Acad. Sci. USA 87, 3410, describe transferrin-polycation conjugates which may enhance uptake of DNA into cells. They also describe the feature of a receptor-mediated endocytosis of transferrin-polycation conjugates to introduce DNA into hematopoietic cells. Wu et al., 1991,  J. Biol. Chem. 266, 14338, describe in vivo receptor-mediated gene delivery in which an asialoglycoprotein-polycation conjugate consisting of asialoorosomucoid is coupled to poly-L-lysine. A soluble DNA complex was formed capable of specifically targeting hepatocytes via asialoglycoprotein receptors present on the cells. 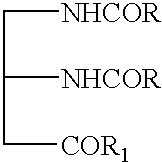 wherein, n is 1, 2 or 3 carbon atoms; n 1 is 2, 3, 4 or 5 carbon atoms; R and R1 independently represent C12-C22 alkyl chain which are saturated or unsaturated, wherein the unsaturation is represented by 1-4 double bonds; and R2 and R3 are independently H, acyl, alkyl, carboxamidine, aryl, acyl, substituted carboxamidine, polyethylene glycol (PEG) or a combination thereof. wherein, n is 1, 2 or 3 carbon atoms; n 1 is 2, 3, 4 or 5 carbon atoms; R and R1 independently represent C12-C22 alkyl chain which are saturated or unsaturated, wherein the unsaturation is represented by 1-4 double bonds; and Alk represents methyl, hydroxyalkyl (e.g., hydroxymethyl and hydroxyalkyl) or a combination thereof. wherein, R and R 1 independently represent C12-C22 alkyl chain which are saturated or unsaturated, wherein the unsaturation is represented by 1-4 double bonds; and R2 is H, PEG, acyl or alkyl. where R 3 is H, or PO3H2 and R4 is OH, NH2 or ═O. wherein, n is 1-6 carbon atoms; X and X 1 independently represent C12-C22 alkyl chain which are saturated or unsaturated, wherein the unsaturation is represented by 1-4 double bonds; B is a nucleic acid base or H; and R5 is H, PEG, or carboxamidine. wherein, R 6 is selected from the group consisting of arginyl methyl ester, arginyl amide, homoarginyl methyl ester, homoarginyl amide, ornithine methyl ester, ornithine amide, lysyl methyl ester, lysyl amide, triethylenetetramine (TREN), N,N′-di-carboxamidine TREN, N-benzyl histidyl methyl ester, pyridoxyl and aminopropylimidazole. L1 is a linker represented by R7PO2, wherein R7 is H, CH3, or CH2CH3. Examples of this group of compounds are: PH55933, PH55938, PH55939, PH55941, PH55942, PH55943 and PH55945. wherein, R 8 is selected from the group consisting of arginyl, N-Boc arginyl, homoarginyl, N-Boc homoarginyl, ornithine, N-Boc ornithine, N-benzyl histidyl, lysyl, N-Boc lysyl, N-methyl arginyl, N-methyl guanidine, guanidine and pyridoxyl. 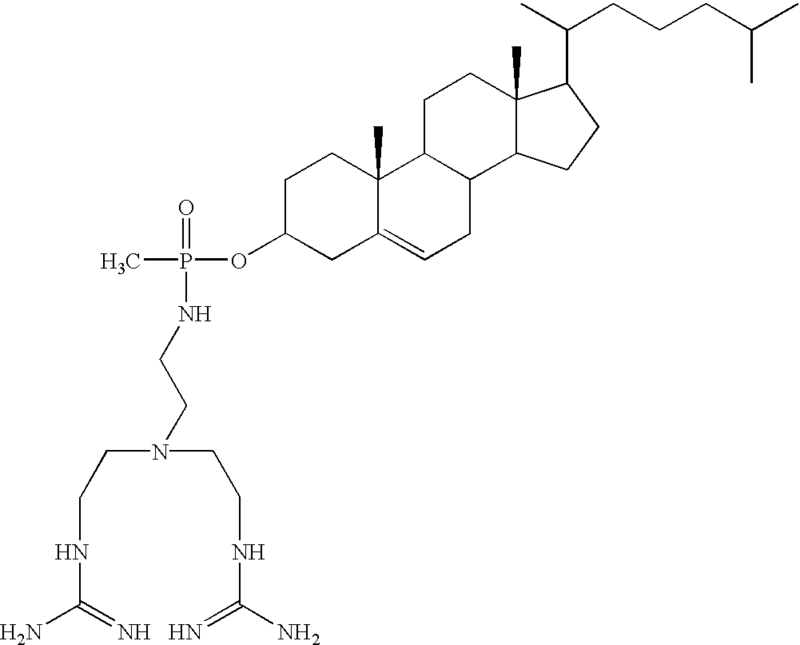 L2 is a linker represented by NH, glycine, N-butyldiamine or guanidine. 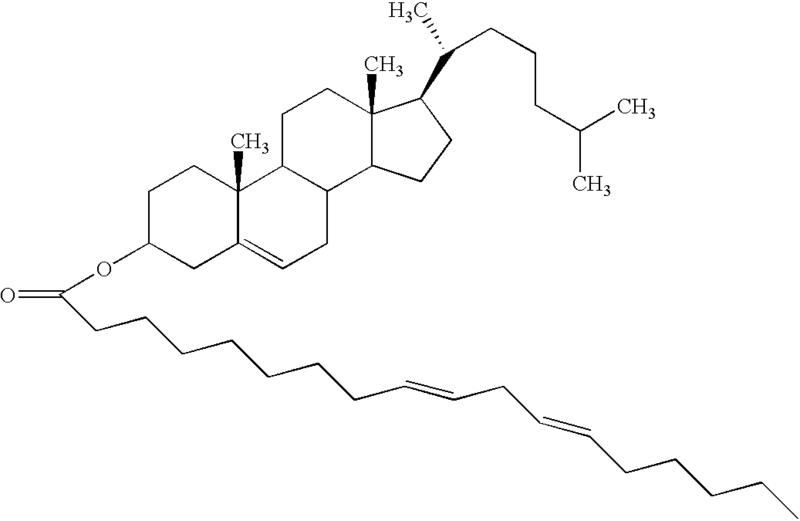 Examples of this compound is Boc arginine cholesteryl amide (DS46596), N-guanyl-cholesterylamide (DS57511). 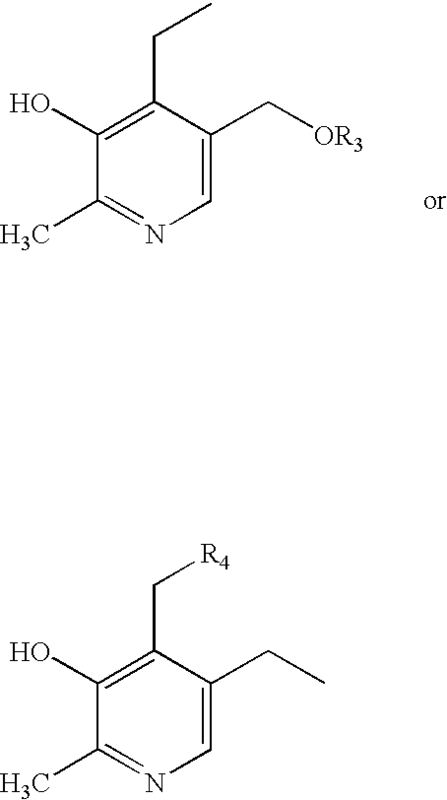 Wherein R is independently a C12-C22 alkyl chain which are saturated or unsaturated, wherein the unsaturation is represented by 1-4 double bonds and R 1 is represented by TREN, N,N′-di-carboxamidine TREN, lysyl, arginyl, omithyl, homoarginyl, histidyl, aminopropylimidazole, spermine carboxylic acid. In yet another embodiment, the lipid molecules of the invention, such as cationic lipids, are provided as a lipid aggregate, such as a liposome, and co-encapsulated with the compound or polymer to be delivered. Liposomes, which can be unilamellar or multilamellar, can introduce encapsulated material into a cell by different mechanisms. See, Ostro,  Scientific American 102, January 1987. For example, the liposome can directly introduce its encapsulated material into the cell cytoplasm by fusing with the cell membrane. Alternatively, the liposome can be compartmentalized into an acidic vacuole (i.e., an endosome) having a pH below 7.0. This low pH allows ion-pairing of the encapsulated enhancers and the negatively charged polymer, which facilitates diffusion of the enhancer:polymer complex out of the liposome, the acidic vacuole, and into the cellular cytoplasm. In another embodiment the invention features a lipid aggregate formulation including phosphatidylcholine (of varying chain length; e.g., egg yolk phosphatidylcholine), cholesterol, a cationic lipid, and 1,2-distearoyl-sn-glycero-3-phosphoethanolamine-polythyleneglycol-2000 (DSPE-PEG 2000). The cationic lipid component of this lipid aggregate can be any cationic lipid known in the art such as dioleoyl 1,2,-diacyl-3-trimethylammonium-propane (DOTAP). In yet another embodiment this lipid aggregate comprises a lipid described in any of the Formulae I-IX and/or Lipid ID Nos: 700, 701, 705, 709, 719, 722, 723, 725, 726, 727, 732, 736, 737, 738, 739, 742, 743, 744, 745, 746, 747, 749, 750, 751, 752, and/or 753,. FIGS. 1A-C depict the different classes of lipids of the instant invention. FIGS. 11 depicts a scheme for the synthesis of vitamin-B6-cholesterol conjugate. FIGS. 12A-G shows the secondary structure model for seven different classes of enzymatic nucleic acid molecules. Arrow indicates the site of cleavage. - - - indicate the target sequence. Lines interspersed with dots are meant to indicate tertiary interactions. - is meant to indicate base-paired interaction. FIG. 12A shows a Group I Intron motif: P1-P9.0 represent various stem-loop structures (Cech et al., 1994, Nature Struc. Bio., 1, 273). FIG. 12B shows an RNase P (MIRNA) motif: EGS represents external guide sequence (Forster et al, 1990, Science, 249, 783; Pace et al., 1990, J. Biol. Chem., 265, 3587). FIG. 12C shows a Group II Intron motif: 5′SS means 5′ splice site; 3′SS means 3′-splice site; IBS means intron binding site; EBS means exon binding site (Pyle et al., 1994, Biochemistry, 33, 2716). FIG. 12D shows a VS RNA motif: I-VI are meant to indicate six stem-loop structures; shaded regions are meant to indicate tertiary interaction (Collins, International PCT Publication No. WO 96/19577). FIG. 12E shows a HDV Ribozyme motif: : I-IV are meant to indicate four stem-loop structures (Been et al., U.S. Pat. No. 5,625,047). FIG. 12F shows a Hammerhead Ribozyme motif:: I-III are meant to indicate three stem-loop structures; stems I-III can be of any length and may be symmetrical or asymmetrical (Usman et al., 1996, Curr. Op. Struct. Bio., 1, 527). FIG. 12G shows a Hairpin Ribozyme motif: H1-H4 are meant to indicate helices 1-4; Helix 1 and 4 can be of any length; Helix 2 is between 3 and 8 base-pairs long; Y is a pyrimidine; B is guanosine, cytidine or uridine; V is adenosine, guanosine, or cytidine (Burke et al., 1996, Nucleic Acids & Mol. Biol., 10, 129; Chowrira et al., U.S. Pat. No. 5,631,359). FIG. 14 depicts the chemical synthesis of N 2,N3-di-oleyl-(N,N′-diguanidinoethyl-aminoethane)-2,3-diaminopropionic acid. FIG. 15 depicts the results of a blood clearance study using the EPC:CHOL:DOTAP:DSPE 2000 liposome. FIG. 18 depicts the results of a cellular inhibition study of IMPDH-2 mRNA expression in Jurkat cells treated for 24 hours with IMPDH antisense and lipid NC 388. The term “compounds with neutral charge” as used herein refers to compositions which are neutral or uncharged at neutral or physiological pH. Examples of such compounds include cholesterol (i.e., a steroidal alcohol, as defined in Lehninger,  Biochemistry, 1982 ed., Worth Pub., p. 315) and other steroids, cholesteryl hemisuccinate (CHEMS), dioleoyl phosphatidyl choline, distearoylphosphotidyl choline (DSPC), fatty acids such as oleic acid, phosphatidic acid and its derivatives, phosphatidyl serine, polyethylene glycol-conjugated phosphatidylamine, phosphatidylcholine, phosphatidylethanolamine and related variants, prenylated compounds including famesol, polyprenols, tocopherol, and their modified forms, diacylsuccinyl glycerols, fusogenic or pore forming peptides, dioleoylphosphotidylethanolamine (DOPE), ceramide and the like. The term “alkyl” as used herein refers to a saturated aliphatic hydrocarbon, including straight-chain, branched-chain, and cyclic alkyl groups. In one embodiment, the alkyl group has 1 to 12 carbons. In another embodiment the alkyl is a lower alkyl of from 1 to 7 carbons, for example 1 to 4 carbons. The alkyl group can be substituted or unsubstituted. When substituted the substituted group(s) can be for example a, hydroxy, cyano, alkoxy, NO 2 or N(CH3)2, amino, or SH group. The term “alkenyl” as used herein refers to unsaturated hydrocarbon groups containing at least one carbon-carbon double bond, including straight-chain, branched-chain, and cyclic groups. In one embodiment, the alkenyl group has 1 to 12 carbons. In another embodiment, the alkenyl group is a lower alkenyl of from 1 to 7 carbons, for example 1 to 4 carbons. The alkenyl group can be substituted or unsubstituted. When substituted the substituted group(s) can include, hydroxyl, cyano, alkoxy, NO 2, halogen, N(CH3)2, amino, and/or SH groups. The term “alkynyl” as used herein refers to an unsaturated hydrocarbon group containing at least one carbon-carbon triple bond, including straight-chain, branched-chain, and cyclic groups. In one embodiment, the alkynyl group has 1 to 12 carbons. In another embodiment the alkynyl group is a lower alkynyl of from 1 to 7 carbons, for example 1 to 4 carbons. The alkynyl group can be substituted or unsubstituted. When substituted the substituted group(s) can include, hydroxyl, cyano, alkoxy, ═O, ═S, NO 2 or N(CH3)2, amino and/or SH groups. By “antisense nucleic acid”, as used herein refers to a non-enzymatic nucleic acid molecule that binds to target nucleic acid by means of RNA-RNA or RNA-DNA or RNA-PNA (protein nucleic acid; Egholm et al., 1993  Nature 365, 566) interactions and alters the activity of the target nucleic acid (for a review, see Stein and Cheng, 1993 Science 261, 1004 and Woolf et al., U.S. Pat. No. 5,849,902). Typically, antisense molecules are complementary to a target sequence along a single contiguous sequence of the antisense molecule. However, in certain embodiments, an antisense molecule can bind to substrate such that the substrate molecule forms a loop, and/or an antisense molecule can bind such that the antisense molecule forms a loop. Thus, the antisense molecule can be complementary to two (or even more) non-contiguous substrate sequences or two (or even more) non-contiguous sequence portions of an antisense molecule can be complementary to a target sequence or both. For a review of current antisense strategies, see Schmajuk et al., 1999, J. Biol. Chem., 274, 21783-21789, Delihas et al., 1997, Nature, 15, 751-753, Stein et al., 1997, Antisense N. A. Drug Dev., 7, 151, Crooke, 2000, Methods Enzymol., 313, 3-45; Crooke, 1998, Biotech. Genet. Eng. Rev., 15, 121-157, Crooke, 1997, Ad. Pharmacol., 40, 1-49. In addition, antisense DNA can be used to target nucleic acid by means of DNA-RNA interactions, thereby activating RNase H, which digests the target nucleic acid in the duplex. The antisense oligonucleotides can comprise one or more RNAse H activating region, which is capable of activating RNAse H cleavage of a target nucleic acid. Antisense DNA can be synthesized chemically or expressed via the use of a single stranded DNA expression vector or equivalent thereof. By “2-5A antisense chimera” as used herein refers to an antisense oligonucleotide containing a 5′-phosphorylated 2′-5′-linked adenylate residue. These chimeras bind to target nucleic acid in a sequence-specific manner and activate a cellular 2-5A-dependent ribonuclease which, in turn, cleaves the target nucleic acid (Torrence et al., 1993  Proc. Natl. Acad. Sci. USA 90, 1300; Silverman et al., 2000, Methods Enzymol., 313, 522-533; Player and Torrence, 1998, Pharmacol. Ther., 78, 55-113). By “triplex forming oligonucleotides” as used herein refers to an oligonucleotide that can bind to a double-stranded polynucleotide, such as DNA, in a sequence-specific manner to form a triple-strand helix. Formation of such triple helix structure has been shown to inhibit transcription of the targeted gene (Duval-Valentin et al., 1992  Proc. Natl. Acad. Sci. USA 89, 504; Fox, 2000, Curr. Med. Chem., 7, 17-37; Praseuth et. al., 2000, Biochim. Biophys. Acta, 1489, 181-206). By “nucleic acid decoy molecule”, or “decoy” as used herein refers to a nucleic acid molecule that mimics the natural binding domain for a ligand. The decoy therefore competes with the natural binding target for the binding of a specific ligand. For example, it has been shown that over-expression of HIV trans-activation response (TAR) RNA can act as a “decoy” and efficiently binds HIV tat protein, thereby preventing it from binding to TAR sequences encoded in the HIV RNA (Sullenger et al., 1990 , Cell, 63, 601-608). By “aptamer” or “nucleic acid aptamer” as used herein refers to a nucleic acid molecule that binds specifically to a target molecule wherein the nucleic acid molecule has sequence that is distinct from sequence recognized by the target molecule in its natural setting. Alternately, an aptamer can be a nucleic acid molecule that binds to a target molecule where the target molecule does not naturally bind to a nucleic acid. The target molecule can be any molecule of interest. For example, the aptamer can be used to bind to a ligand binding domain of a protein, thereby preventing interaction of the naturally occurring ligand with the protein, see for example Gold et al., U.S. Pat. No. 5,475,096 and 5,270,163; Gold et al., 1995 , Annu. Rev. Biochem., 64, 763; Brody and Gold, 2000, J. Biotechnol., 74, 5; Sun, 2000, Curr. Opin. Mol. Ther., 2, 100; Kusser, 2000, J. Biotechnol., 74, 27; Hermann and Patel, 2000, Science, 287, 820; and Jayasena, 1999, Clinical Chemistry, 45, 1628. The term “double stranded RNA” or “dsRNA” as used herein refers to a double stranded RNA molecule capable of RNA interference “RNAi”, including short interfering RNA “siRNA” see for example Bass, 2001 , Nature, 411, 428-429; Elbashir et al., 2001, Nature, 411, 494-498; and Kreutzer et al., International PCT Publication No. WO 00/44895; Zernicka-Goetz et al, International PCT Publication No. WO 01/36646; Fire, International PCT Publication No. WO 99/32619; Plaetinck et al., International PCT Publication No. WO 00/01846; Mello and Fire, International PCT Publication No. WO 01/29058; Deschamps-Depaillette, International PCT Publication No. WO 99/07409; and Li et al., International PCT Publication No. WO 00/44914. The term “nucleotide” as used herein refers to a heterocyclic nitrogenous base in N-glycosidic linkage with a phosphorylated sugar. Nucleotides are recognized in the art to include natural bases (standard), and modified bases well known in the art. Such bases are generally located at the 1′ position of a nucleotide sugar moiety. Nucleotides generally comprise a base, sugar and a phosphate group. 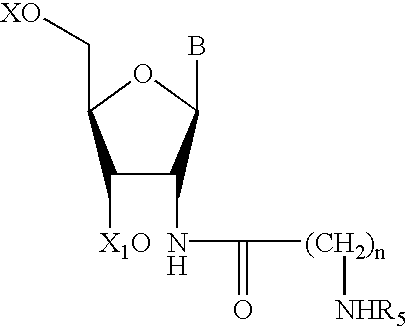 The nucleotides can be unmodified or modified at the sugar, phosphate and/or base moiety, (also referred to interchangeably as nucleotide analogs, modified nucleotides, non-natural nucleotides, non-standard nucleotides and other; see for example, Usman and McSwiggen, supra; Eckstein et al., International PCT Publication No. WO 92/07065; Usman et al., International PCT Publication No. WO 93/15187; Uhlman & Peyman, supra all are hereby incorporated by reference herein). There are several examples of modified nucleic acid bases known in the art as summarized by Limbach et al., 1994 , Nucleic Acids Res. 22, 2183. Some of the non-limiting examples of chemically modified and other natural nucleic acid bases that can be introduced into nucleic acids include, inosine, purine, pyridin-4-one, pyridin-2-one, phenyl, pseudouracil, 2,4,6-trimethoxy benzene, 3-methyl uracil, dihydrouridine, naphthyl, aminophenyl, 5-alkylcytidines (e.g., 5-methylcytidine), 5-alkyluridines (e.g., ribothymidine), 5-halouridine (e.g., 5-bromouridine) or 6-azapyrimidines or 6-alkylpyrimidines (e.g. 6-methyluridine), propyne, quesosine, 2-thiouridine, 4-thiouridine, wybutosine, wybutoxosine, 4-acetylcytidine, 5-(carboxyhydroxymethyl)uridine, 5′-carboxymethylaminomethyl-2-thiouridine, 5-carboxymethylaminomethyluridine, beta-D-galactosylqueosine, 1-methyladenosine, 1-methylinosine, 2,2-dimethylguanosine, 3-methylcytidine, 2-methyladenosine, 2-methylguanosine, N6-methyladenosine, 7-methylguanosine, 5-methoxyaminomethyl-2-thiouridine, 5-methylaminomethyluridine, 5-methylcarbonylmethyluridine, 5-methyloxyuridine, 5-methyl-2-thiouridine, 2-methylthio-N6-isopentenyladenosine, beta-D-mannosylqueosine, uridine-5-oxyacetic acid, 2-thiocytidine, threonine derivatives and others (Burgin et al., 1996, Biochemistry, 35, 14090; Uhlman & Peyman, supra). By “Inozyme” or “NCH” motif or configuration is meant, an enzymatic nucleic acid molecule comprising a motif as is generally described as NCH Rz in Ludwig et al., International PCT Publication No. WO 98/58058 and U.S. patent application Ser. No. 08/878,640. Inozymes possess endonuclease activity to cleave RNA substrates having a cleavage triplet NCH/, where N is a nucleotide, C is cytidine and H is adenosine, uridine or cytidine, and / represents the cleavage site. Inozymes can also possess endonuclease activity to cleave RNA substrates having a cleavage triplet NCN/, where N is a nucleotide, C is cytidine, and / represents the cleavage site By “G-cleaver” motif or configuration is meant, an enzymatic nucleic acid molecule comprising a motif as is generally described in Eckstein et al., U.S. Pat. No. 6,127,173 and in Kore et al., 1998 , Nucleic Acids Research 26, 4116-4120. G-cleavers possess endonuclease activity to cleave RNA substrates having a cleavage triplet NYN/, where N is a nucleotide, Y is uridine or cytidine and / represents the cleavage site. G-cleavers can be chemically modified. The term “DNAzyme” as used herein refers to an enzymatic nucleic acid molecule that does not require the presence of a 2′-OH group within it for its activity. 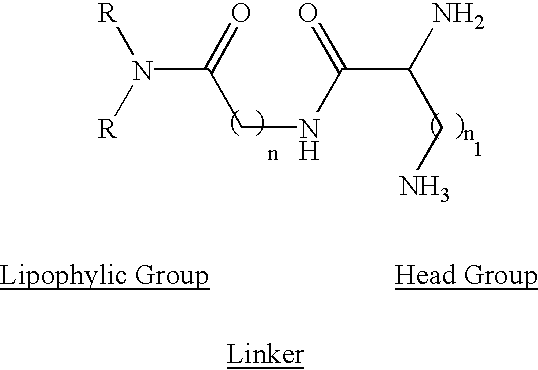 In particular embodiments the enzymatic nucleic acid molecule can have an attached linker(s) or other attached or associated groups, moieties, or chains containing one or more nucleotides with 2′-OH groups. DNAzymes can be synthesized chemically or expressed endogenously in vivo, by means of a single stranded DNA vector or equivalent thereof. Examples of DNAzymes are generally reviewed in Usman et al., International PCT Publication No. WO 95/11304; Chartrand et al., 1995 , NAR 23, 4092; Breaker et al., 1995, Chem. Bio. 2, 655; Santoro et al., 1997, PNAS 94, 4262; Breaker, 1999, Nature Biotechnology, 17, 422-423; and Santoro et. al., 2000, J. Am. Chem. Soc., 122, 2433-39; Perrin et al., 2001, JACS., 123, 1556. Additional DNAzyme motifs can be selected for using techniques similar to those described in these references, and hence, are within the scope of the present invention. In one embodiment, the invention features the use of the cationic lipids of the invention in a composition comprising surface-modified liposomes containing poly (ethylene glycol) lipids (PEG-modified, or long-circulating liposomes or stealth liposomes). These formulations offer an method for increasing the accumulation of drugs in target tissues. This class of drug carriers resists opsonization and elimination by the mononuclear phagocytic system (MPS or RES), thereby enabling longer blood circulation times and enhanced tissue exposure for the encapsulated drug (Lasic et al. Chem. Rev. 1995, 95, 2601-2627; Ishiwataet al., Chem. Pharm. Bull. 1995, 43, 1005-1011). Such liposomes have been shown to accumulate selectively in tumors, presumably by extravasation and capture in the neovascularized target tissues (Lasic et al., Science 1995, 267, 1275-1276; Oku et al., 1995, Biochim. Biophys. Acta, 1238, 86-90). The long-circulating liposomes enhance the pharmacokinetics and pharmacodynamics of DNA and RNA, particularly compared to conventional cationic liposomes which are known to accumulate in tissues of the MPS (Liu et al., J. Biol. Chem. 1995, 42, 24864-24870; Choi et al., International PCT Publication No. WO 96/10391; Ansell et al., International PCT Publication No. WO 96/10390; Holland et al., International PCT Publication No. WO 96/10392; all of these are incorporated by reference herein). Long-circulating liposomes are also likely to protect drugs from nuclease degradation to a greater extent compared to cationic liposomes, based on their ability to avoid accumulation in metabolically aggressive MPS tissues such as the liver and spleen. All of these references are incorporated by reference herein. The present invention also includes compositions prepared for storage or administration which include a pharmaceutically effective amount of the desired compounds in a pharmaceutically acceptable carrier or diluent. Acceptable carriers or diluents for therapeutic use are well known in the pharmaceutical art, and are described, for example, in  Remington's Pharmaceutical Sciences, Mack Publishing Co. (A. R. Gennaro edit. 1985) hereby incorporated by reference herein. For example, preservatives, stabilizers, dyes and flavoring agents may be provided. Id. at 1449. These include sodium benzoate, sorbic acid and esters of p-hydroxybenzoic acid. In addition, antioxidants and suspending agents may be used. Id. Synthesis of N′-palmityl-N′-oleyl-N-CBZ-glycinamide (2): (1) (2.46 g, 5 mmol) was added to a solution of N-CBZ-glycine N-hydroxysuccinimide ester (3.06 g, 10 mmol) suspended in dichloromethane (1.39 ml) containing triethylamine (TEA)(10 mmol). The reaction mixture was stirred at room temperature overnight and then concentrated to an oil under vacuum. Silica gel chromatography using 1-5% gradient methanol in dichloromethane gave 1.54 g of N′-palmityl-N′-oleyl-N-CBZ-glycinamide (yield, 45%). 1H NMR (CDCl3) d 7.35 (m, phenyl), 5.83 (br s, NH), 5.35 (m, CH═CH), 5.12 (s, 2H, CH2Ph), 4.00 (m, 2H, glycyl), 3.31 (m, 2H), 3.13 (m, 2H), 2.00 (m, 4H), 1.53 (m, 4H), 1.25 (m, 48H), 0.88 (m, 6H). Synthesis of N′-palmityl-N′-oleyl-glycinamide (3): 10% Palladium on Carbon (Pd/C) was added to N′-palmityl-N′-oleyl-N-CBZ-glycinamide (0.5 g, 0.73 mmol) dissolved in absolute ethanol (3 ml) under argon gas. The flask was immersed in a 20° C. water bath prior to the addition of 1,4-cyclohexadiene (0.66 ml). The reaction mixture was stirred at room temperature overnight, the catalyst was filtered off and the filtrate evaporated to dryness giving 0.3 g of product (yield, 75%). 1H NMR (acetone-d6) d 5.41 (m, 2H, CH═CH), 4.07 (br s, 2H, glycyl), 3.36 (m, 2H), 3.29 (m, 2H), 2.80 (br s, NH2), 2.05 (m, 2H), 1.98 (m, 2H), 1.63 (m, 2H), 1.25 (m, 48H), 0.87 (m, 6H). FAB-MS: 549 [M+H]+. Synthesis of N′-palmityl-N′-oleyl-alpha,gamma-bis-Boc-diaminobutyryl-glycinamide (4): The mixture of 3 (1.12 g, 2.04 mmol), N-alpha-N-gamma-di-Boc-diaminobutyric acid (631 mg, 2.24 mmol), 2-ethoxy-1-ethoxycarbonyl-1,2-dihydroquinoline (EEDQ) (553 mg, 2.24 mmol) in CH 2Cl2 was stirred for 1 hour at room temperature. The mixture was then concentrated to a syrup and 1.2 g of the product was isolated by column chromatography using 20-50% gradient of hexanes in ethyl acetate (yield, 69%). 1H NMR (CDCl3) d 7.14 (br s, NH), 5.38 (m, 2H, CH═CH), 5.28 (br s, 1H, NH), 5.12 (br s, 1H, NH), 4.02 (m, 2H, glycyl), 3.42 (m, 1H), 3.31 (m, 2H), 3.15 (m, 2H), 3.02 (m, 2H), 1.95 (m, 4H), 1.77 (m, 2H), 1.53 (m, 4H), 1.25 (m, 48 H). FAB-MS: 850 [M+H]+. Synthesis of N′-palmityl-N′-oleyl-alpha, gamma-diaminobutyryl-glycinamide (JA59311)(5): compound 4 (350 mg, 0.41 mmol) was dissolved in dioxane (6 ml) followed by the addition of 4 M HCl in dioxane (6 ml). The reaction mixture was stirred at room temperature for 2 hours, than concentrated in vacuo and azeotroped twice with toluene. The residue was partitioned between CH 2Cl2 and 0.2 N NaOH, the organic layer was washed with saturated NaHCO3 solution, and then dried (Na2SO4) and evaporated to dryness. Flash silica gel chromatography using CH2Cl2/methanol/conc. NH4OH 40:10:2 yielded 200 mg of compound 5 (yield, 75%). 1H NMR (CDCl3) d 8.06 (br s, 1H, NH), 5.38 (m, 2H, CH═CH), 4.04 (m, 2H, glycyl), 3.54 (m, 1H), 3.31 (m, 2H), 3.17 (m, 2H), 2.86 (m, 2H), 1.93 (m, 4H), 1.67 (m, 2H), 1.54 (m, 4H), 1.41 (br s, 4H, NH2), 1.25 (m, 48H), 0.87 (m, 6H). FAB-MS: 650 [M+H]+. Synthesis of N′-palmityl-N′-oleyl-N-gamma-carboxamidine-alpha,gamma-diaminobutyryl-glycinamide (JA59312) (6): To the solution of 5 (0.16 g, 0.25 mmol) and diisopropylethylamine (DIPEA) (83 mL) in THF/methanol 1:1 (0.8 ml), 1H-pyrazole-1-carboxamidine hydrochloride (70 mg, 0.48 mmol) was added under argon gas. The reaction mixture was stirred at room temperature overnight and then concentrated to a syrup. Silica gel column chromatography using CH 2Cl2 followed by CH2Cl2/methanol/conc. NH4OH 40:10:2 yielded 50 mg of compound 6 (yield, 29%). 1H NMR (CDCl3) d 5.37 (m, 2H, CH═CH), 4.07 (m, 2H, glycyl), 3.94 (m, 1H), 3.42 (m, 2H), 3.21 (m, 4H), 2.01 (m, 6H), 1.58 (m, 4H), 1.46 (m, 2H, NH2), 1.25 (m, 48H), 0.87 (m, 6H). FAB-MS: 692 [M+H]+. Synthesis of N′-palmityl-N′-oleyl-alpha,gamma-bis-trimethylammoniumbutyryl-glycinamide (JA59316)(7): A dihydrogenchloride salt of 5 (130 mg, 0.2 mmol) was dissolved in methanol (4 ml) and combined with KHCO 3 (0.2 g) and CH3I (0.2 ml). The mixture was then stirred at room temperature for 3 days. The reaction mixture was then filtered through the bed of Celite, followed by filtration through 0.45 m PTFE filter. The filtrate was then evaporated to dryness affording 160 mg of the desired product (yield, 94%). 1H NMR (CDCl3) d 3.58 [s, 9H, (CH3)3], 3.44 [s, 9H, (CH3)3]. Synthesis of N′-palmityl-N′-oleyl-N-carboxamidine-glycinamide.HCl (JA59314)(8): Using the same procedure described above for the preparation of 6 except that crystallization from methanol instead of column chromatography was used for purification, 8 was prepared in 51% yield. 1H NMR (CDCl3) d 7.70-7.25 (m, 5H, NH), 5.38 (m, 2H, CH═CH), 4.25 (m, 2H, glycyl), 3.27 (m, 4H), 1.96 (m, 4H), 1.53 (m, 4H), 1.25 (m, 48 H), 0.87 (m, 6H). FAB-MS: 592 [M+H]+. Synthesis of N′-palmityl-N′-oleyl-guanidine (JA59317) (9): The mixture of a hydrochloride salt of 1 (285 mg, 0.54 mmol) , cyanamide (50 mg, 1.19 mmol) and 1-butanol (2 ml) was stirred at 120° C. for 2 hours. The cooled mixture was diluted with CH 2Cl2(50 ml) and washed with saturated aqueous NaCl(Brine)/methanol 1:1 (50 ml). The organic layer was then dried (Na2SO4), evaporated to an oil and chromatographed on a column of silica gel using CH2Cl2/methanol/conc. NH4OH 40:10:2 giving 80 mg of the desired material (yield, 28%). 1H NMR (CDCl3) d 7.08 (br s, 1H, NH), 5.34 (m, 2H, CH═CH), 3.29 (m, 4H), 2.00 (m, 4H), 1.62 (m, 4H), 1.25 (m, 48H), 0.88 (m, 6H). FAB-MS: 535 [M+H]+. Synthesis of Boc 3arginineNHcholesterylamide (11): A 200 mL pear shaped flask with stir bar was charged with a mixture of 10 (1 g, 2.6 mmol) , Boc3 arginine (1.2 grams, 2.6 mmol), diisopropylcarbodiimide (450 ul, 2.9 mmol) and dichloromethane (70 mls). The mixture of reagents was stirred at room temperature for two hours. Following the reaction, the solution was washed with aqueous sodium bicarbonate (5% w/v) and the organic layer was separated and dried to a solid using a rotary evaporator. Compound 11 was dissolved in 5 mls of dichloromethane prior to purification using silica gel chromatography. (yield, 90%). Identity was confirmed by ES-MS. 1H NMR (dmso-d6):. 1H NMR (dmso-d6): 9.32 (bd), 6.63 (d), 5.30 (m), 4.00 (m), 3.80 (m) 3.40 (m), 1.539 (s, tBoc), 1.517 (s, tBoc), 1.497(s, tBoc). Synthesis of Boc arginineNHcholesterylamide (DS4659) (12): Compound 11 (50 mg, 60 umol) was dissolved in anhydrous 1,4-dioxane (300 ul) and combined with 4M HCl in dioxane (400 ul). The mixture was left at room temperature for 2 hours and the reaction was stopped by removing all solvent and HCl using a stream of dry nitrogen gas. Compound 12 was isolated using a wide pore C18 silica column and an isocratic methanol: water (88:12) eluant with detection at 210 nm. Fractionation allowed recovery of 20 mgs of compound 12 (yield, 44%). Identity was confirmed by ES-MS.  1H NMR (dmso-d6): 7.82 (d), 6.36 (bs), 3.51 (m), 3.43 (m), 3.33 (m) 3.15 (m), 1.472 (s, tBoc). Synthesis of (13): Referring to the FIG. 4, to a solution of methylphosphonic dichloride (0.332 g, 2.5 mmol,  31p NMR s, 43.93 ppm) stirring at room temperature under positive pressure argon was added 4-dimethylaminopyridine(DMAP) (0.31 g, 2.5 mmol). The resulting clear, colorless solution was cooled to −70 C. and a solution of cholesterol (0.97 g, 2.5 mmol) suspended in anhydrous dichloromethane (20 ml) was added via syringe with vigorous stirring over a period of one hour. The reaction mixture was allowed to warm to room temperature and was maintained at room temperature for 18 hours at which time 31P NMR analysis of a small aliquot of the reaction mixture indicated complete reaction (d, 39.08 ppm). Crude (13) was treated with additional DMAP (0.31 g, 2.5 mmol) and the reaction mixture cooled to −70 C. while stirring under positive pressure argon. H-Lys(Z)-OCH 3 (0.66 g, 2.25 mmol) in anhydrous dichloromethane (20 ml) was added dropwise via syringe over a period of one hour. The reaction mixture was warmed to room temperature and stirred for an additional 18 hours (reaction complete by 31P NMR). Direct loading onto flash silica followed by a gradient of 0 to 10% EtOAc/hexanes then 5% EtOH/dichloromethane gave 1.12 g of (14) (Yield, 60% over two steps). 31P NMR (s, 30.98 ppm). Synthesis of Cholesterol-Lysine-methylphosphonoamidate (PH55933) (15): Compound (14) (1.0 g, 1.35 mmol) was dissolved in anhydrous EtOH and cooled to 0 C. with an ice/water bath while stirring under argon. 10 Pd/c (1.0 g, 1 mass eq.) was added to the reaction mixture followed by dropwise addition of 1,4 cyclohexadiene (1.27 ml, 13.5 mmol). After warming to room temperature, the reaction was complete after 4 hours as determined by TLC (15% MeOH/dichloromethane). The reaction mixture was filtered over celite and dried in vacuo. Flash chromatography utilizing a gradient of 5 to 15% MeOH/dichloromethane 1% TEA afforded 0.64 g of (15): (yield, 78%)  31P NMR (s, 30.88 ppm), mass spec. calcd=606.87, found=607.47. Synthesis of Cholesterol-Homoarginine-methylphosphonoamidate (PH55938) (16): To a solution of (15) (0.131 g, 0.216 mmol) stirring at room temperature under argon in anhydrous DMF (2.0 ml), 1-H-pyrazole-1-carboxamidine.HCl (32 mg, 0.216 mmol) was added followed by diisopropylethylamine (28 ml, 0.216 mmol). The reaction mixture was stripped slightly on a rotovap then rotated overnight without vacuum at room temperature. After removing DMF in vacuo the reaction residue was dissolved in dichloromethane and applied to a flash silica gel column. An isocratic system of 20% MeOH/dichloromethane, 2% NH 4OH followed by treatment with Dowex OH− (300 mg) in MeOH gave 80 mg of desired product (yield, 57%). 31P NMR (s, 31.99 ppm), mass spec. calcd=648.91, found=649.48. Synthesis of Cholesterol-Lysine-methylphosphonoamidate amide (PH55939) (17): Refering to FIG. 5, compound (15) (76 mg, 0.125 mmol) was treated with a 0 C. saturated methanolic ammonia solution (5 ml) at room temperature for 18 hours (some venting required). The reaction mixture was evaporated in vacuo then purified by flash silica gel chromatography to give 45 mg of product (yield,61%). 31P NMR (s, 32.17 ppm), mass spec. calcd=591.86, found=592.23. Synthesis of Cholesterol-TREN-methylphosphonamidate (PH55941) (18): Refering to FIG. 6, 4-Dimethylaminopyridine (DMAP) (0.31 g, 2.5 mmol) was added to a solution of methylphosphonic dichloride (0.332 g, 2.5 mmol,  31P NMR s, 43.93 ppm) stirring at room temperature under positive pressure argon gas. The resulting clear, colorless solution was cooled to −70 C. and a solution of cholesterol (0.97 g, 2.5 mmol) in anhydrous dichloromethane (20 ml) was added via syringe with vigorous stirring over a period of one hour. The reaction mixture was allowed to warm to room temperature and was maintained for 18 hours at which time 31P NMR analysis of a small aliquot of the reaction mixture indicated complete reaction (d, 39.08 ppm). Crude (13) was treated with additional DMAP (0.31 g, 2.5 mmol) and the reaction mixture cooled to −70 C. while stirring under positive pressure argon. Tris(2-aminoethyl)amine (TREN) (0.37 ml, 2.5 mmol) in anhydrous dichloromethane (20 ml) was added dropwise via syringe over a period of two hours. The reaction mixture was warmed to room temperature and stirred for an additional 18 hours (reaction complete by 31P NMR). Direct loading onto flash silica followed by a gradient of 10 to 20% MeOH/dichloromethane with 1 to 4% NH4OH gave 0.442 g of (18) as a white foam: (yield, 28% over two steps), 31P NMR (d, 32.57 ppm), mass spec. calcd=592.89, found=593.49. Synthesis of Cholesterol-TREN-bis-guanidinium methylphosponamidate (PH55942) (19): Compound (18) (0.148 g, 0.25 mmol) was dissolved in anhydrous DMF (1.0 ml) and anhydrous dichoromethane (5.0 ml). 1-H-pyrazole-1-carboxamidine.HCl (73 mg, 0.50 mmol) was added to the reaction mixture followed by diisopropylethylamine (87 ml, 0.50 mmol). Dichloromethane was stripped off of the reaction mixture on a rotovap then rotation continued overnight without vacuum at room temperature. After removing DMF in vacuo the reaction residue was dissolved in dichloromethane and applied to a flash silica gel column. A gradient of 5 to 20% MeOH/dichloromethane with 0.5 to 2% NH 4OH followed by treatment with Dowex OH− (300 mg) in MeOH gave pure (19): 0.11 g, 65%, 31P NMR (d, 33.83 ppm), mass spec. calcd=676.97, found=677.54. Refering to FIG. 7, crude (13) was treated with additional DMAP (0.31 g, 2.5 mmol) and the reaction mixture cooled to −70 C. while stirring under positive pressure argon. H-His(Bzl)OCH 3 (0.65 g, 2.5 mmol) in anhydrous dichloromethane (20 ml) was added dropwise via syringe over a period of one hour. The reaction mixture was then warmed to room temperature and stirred for 18 hours (reaction complete by 31P NMR). Direct loading onto flash silica followed by a gradient of 2 to 10% EtOAc/hexanes then 0 to 5% MeOH/dichloromethane gave 0.53 g of (20) (30% over two steps), 31P NMR (d, 31.39 ppm), mass spec. calcd=705.96, found=706.47. Refering to FIG. 8, crude (13) was treated with additional DMAP (0.31 g, 2.5 mmol) and the reaction mixture cooled to −70 C. while stirring under positive pressure argon. 1-(3-aminopropyl)-imidazole (0.30 ml, 2.5 mmol) in anhydrous dichloromethane (20 ml) was added dropwise via syringe over a period of one hour. The reaction mixture was warmed to rt and stirred at rt for an additional 18 hours (reaction complete by  31P NMR). Direct loading onto flash silica after saturated bicarb washing followed by a gradient of 0 to 10% EtOAc/hexanes then 0 to 10% MeOH/dichloromethane affording 0.77 g of (21): (yield, 54% over two steps), 31P NMR (d, 32.47 ppm), mass spec. calcd=571.82, found=572.33. Synthesis of N-CBZ-beta-Alanine N-hydroxysuccinimide ester (22): Refering to FIG. 9, the compound was prepared according to Lewis et al. PNAS 1996, 93, 3176-3181 (incorporated by reference herein). Yield 80%. 1H NMR (DMSO-d6) d 7.42 (t, 1H, NH), 7.33 (m, 5H, benzyl), 5.009 (s, CH2), 1.47 (m, 4H), 3.32 (m, 2H, CH2NH), 2.86 (t, 2H,CH2CO), 2.79 (s, 4H, CH2CH2). Synthesis of N′-palmityl-N′-oleyl-N-CBZ-beta-alanine amide (23): compound 22 (1.0 g, 2.03 mmol) was added to a solution of N-CBZ-beta-Alanine N-hydroxysuccinimide ester (0.16 g, 0.5 mmol) in CH 2Cl2 containing Et3N (0.42 ml, 3 mmol). The reaction mixture was stirred at room temperature overnight, diluted with dichloromethane and washed with saturated NaHCO3 and brine. Organic layer was dried over sodium sulfate and evaporated to dryness. The residue was purified by flash chromatography on silica using mixture of EtOAc-Hexanes (1:3) as an eluent to give 1.32 g of 23 as a yellow oil(yield, 93%). 1H NMR (CDCl3) d 7.34 (m, phenyl), 5.62 (t, NH), 5.35 (m, CH═CH), 5.082 (s, 2H, CH2Ph), 3.49 (m, 2H, CH2NH), 3.27 (m, 2H,), 3.15 (m, 2H), 2.5 (m, 2H, CH2 CO), 2.00 (m, 4H), 1.49 (m, 4H), 1.25 (m, 48H), 0.87 (m, 6H). Synthesis of N′-palmityl-N′-oleyl-beta-alanine amide (AK 524-68) (POABA)(24): compound 23 (1.2 g, 1.72 mmol) was dissolved in absolute ethanol (10 ml) and 10% Pd-C was added under argon. The flask was then immersed in a 20° C. water bath prior to the addition of 1,4-cyclohexadiene (1.6 ml). The reaction mixture was stirred at room temperature for 40 hours, the catalyst was filtered off and the filtrate evaporated to dryness. The residue was purified by flash chromatography on silica eluting with the linear gradient of MeOH (5% to 10%) in dichloromethane to give 0.68 g, of 24 (yield, 70%). 1H NMR (CDCl3) d 5.37 (m, 2H, CH═CH), 3.26 (m, 4H,), 3.16 (m, 2H), 2.75 (t, NH2), 1.95 (m, 2H), 1.51 (m, 4H), 1.25 (m, 48H), 0.87 (m, 6H). FAB-MS: 563.6 [M+H]+. Synthesis of N′-palmityl-N′-oleyl-N-carboxamidine-beta-alanine amide (AK 524-73) (GPPOA) (25): The mixture of 24 (60 mg, 0.11 mmol), pyrazole carboxamidine hydrochloride (16 mg, 0.11 mmol) and diisopropylethylamine (20 mL, 0.12 mmol) in 0.5 mL of THF-MeOH (1:1) was stirred overnight at room temperature. It was then evaporated to dryness, dissolved in dichloromethane and washed with aqueous ammonia. The organic layer was dried over sodium sulfate to give 25 as an yellowish oil. Yield near quantitative. 1H NMR (CDCl3) d 7.70-7.25 (m, 5H, NH), 5.38 (m, 2H, CH═CH), 3.43 (m, 2H, CH2NH), 3.23 (m, 2H), 3.17 (m, 2H), 2.54 (m 2H, CH2CO)1.96 (m, 4H), 1.49 (m, 4H), 1.25 (m, 48 H), 0.87 (m, 6H). FAB-MS: 605.6 [M+H]+. Synthesis of N(N″-palmityl-N″-oleyl-amidopropyl)pyridoxamine (AK 524-74) (POCAEP) (26): Compound 26 was prepared analogously to compound 27 (Yield, 78%). FAB-MS: 714.6 [M+H] +. 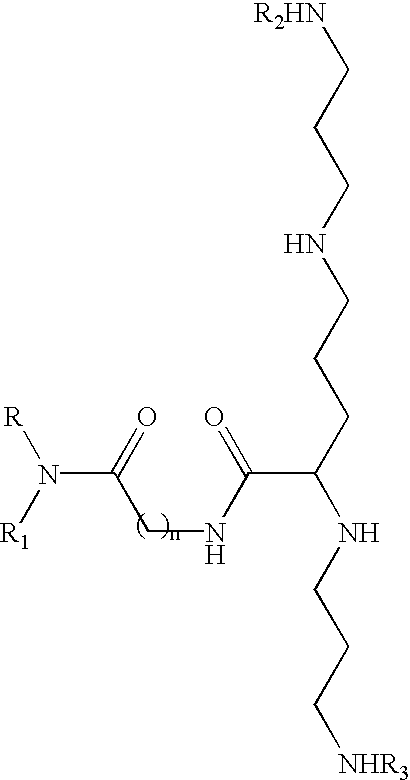 N-cholesteryl-pyridoxamine (AK524-76) (CCAEP) (27): Refering to FIG. 11, The suspension of Pyridoxal hydrochloride (0.1 g, 0.5 mmol) in ethanol was brought to pH 7 with 1N NaOH followed by the addition of aminocholesterol (0.19 g, 0.5 mmol). The pH of the resulting bright yellow solution was adjusted to 8 (1N NaOH) and set aside for 10 minutes. Sodium borohydride (20 mg, 0.5 mmol) was then added to the reaction mixture resulting in immediate color disappearance. After 15 minutes reaction mixture was acidified (pH 6) with 1N HCl, diluted with dichloromethane and washed with aqueous ammonia and water. The organic layer was dried over sodium sulfate and evaporated to dryness. The residue was purified by flash chromatography on silica using 10% MeOH in dichloromethane as an eluent to give 0.25g (93%) of 27 . 1H NMR (CDCl3) d 7.78 (s, 1H, H-6 Pyr), 4.58 (s, 2H, CH2O), 4.06 (AB-quartet 2H, CH2N), 2.4 (s, 3H, 2-CH3), 2.2-0.24 (m, cholesteryl moiety). FAB-MS: 537.4 [M+H]+. 2′-Deoxy-2′-(N-Fmoc-beta-alanineamido) uridine (28): Referring to FIG. 10, EEDQ (4.2 g, 17 mmol) was added to the solution of 2′-amino-2′-deoxy uridine (4 g, 16.45 mmol) and N-FMOC-beta-alanine (5.1 g, 16.45 mmol) in methanol and the reaction mixture was boiled for two hours. Subsequent flash chromatography on silica using a linear gradient of methanol (5% to 10% ) in dichloromethane afforded 6 g of 2′-Deoxy-2′-(N-Fmoc-beta-alanineamido) uridine (77%). 1H NMR (CDCl3-DMSO-d6) d 10.398 (s, 1H, N3-H), 6.98-7.63 (m, H6, Fmoc), 6.16 (t, 1H, NHFmoc), 5.73 (d, 1H, H1′, J1′,2′ 8.4), 5.34 (d, 1H, H5), 4.22 (m, 1H, 2′-H) 3.98 (dd 2H, CH2), 3.88 (m, 1H, 3′-H), 3.77 (br s, 1H, 4′-H), 3.43 (m, 2H, 5′-CH2), 3.1 (m, 2H, CH2NHFmoc), 2.07 (t, 2H, CH2CO). Synthesis of 3′,5′-Di-palmitoyl-2′-deoxy-2′-(beta-alanineamido) uridine (AK 524-71) (30): To the solution of 29 (0.5 g, 0.49 mmol) in dichloromethane (5 mL) was added morpholine (1 mL) and the reaction mixture was stirred at room temperature for 36 hours. Subsequent flash chromatography on silica using linear gradient of methanol (5% to 10%) in dichloromethane afforded 0.22 g of desired product (yield, 56%) of 30. FAB-MS: 791.6 [M+H] +. Synthesis of 3′,5′-Di-palmitoyl-2′-deoxy-2′-(N-carboxamidine-beta-alanineamido) uridine (AK 524-75) (31): Compound 31 was prepared analogously to compound 25. Yield 80%. FAB-MS: 833.6 [M+H] +. Cellular delivery and efficacy assays were carried out in monolayer cultures of cells originating from normal tissues or tumors (Table II, III and V). Cells were maintained in humidified incubators using growth medium recommended by the supplier. Hammerhead ribozymes were synthesized and purified using standard protocols (Wincott et al., 1995, 23, 2677; Beigelman et al., 1995 , J. Biol. Chem. 270, 25702; both are incorporated by reference herein). Nuclease resistant linkages were incorporated at specific sites of the ribozymes, modifications that markedly increased the serum half-life from a few minutes to several hours. For cellular delivery studies, fluorophore-tagged 32-mer ribozymes were prepared by attaching a fluorescein or rhodamine moiety to the loop portion through a aminolinker-modified base (FIG. 13). An expression plasmid encoding the humanized Green Fluorescent Protein (plasmid pEGFP-C1) was obtained from Clontech. In typical cell proliferation, subconfluent cultures of rat aortic smooth muscle cells (RASMC) were plated in 48-well plates in DMEM supplemented with amino acids, Hepes, and 10% fetal bovine serum (5000 cells/ well/0.5 ml medium). Next day, cells were serum-starved, to inhibit proliferation, by replacing the medium with low serum medium (0.5% serum) for ˜2 days. The starved cells were then treated with ribozyme-carrier formulations, usually 100 nM ribozyme premixed with 2.5-10 μg/ml carrier lipid, in serum-free medium for ˜2 h, followed by “trafficking” in low serum-medium (0.25% serum) for ˜20 h. Triplicate set of wells were exposed to each treatment. The cells were then stimulated to proliferate for 12 h in medium containing 10% serum. This was followed by another 8 h incubation in medium+10% serum+ 3H-thymidine (˜1 μCi/ml). The cells were then fixed with ice-cold 10% trichloroacetic acid, washed twice with water, and 3H-thymidine incorporated into new DNA was measured by scintillation counting. The inhibition of proliferation using different ribozyme formulations is shown in Table V.
Formation of EPC:CHOL:DOTAP:DSPE-PEG 2000: Egg yolk phosphatidylcholine (EPC), cholesterol, and DOTAP were purchased from Avanti Polar Lipids. DSPE-PEG 2000 (1,2-Distearoyl-sn-glycero-3-phosphoethanolamine-polythylene glycol-2000) was purchased from Shearwater polymers. Extruder was purchased from Lipex biomembranes. FPLC was purchased from Pharmacia. Radioactive compounds were purchased from NEN and ether from Sigma. The following lipids suspended in chloroform were mixed together in a 50 ml round bottom flask:phosphatidylcholine (egg yolk) (85.5 mg), cholesterol (21.8 mg), DOTAP (23.7 mg), ceramide-PEG C20 (61.8 mg) resulting in a molar ratio of 50:25:15:10. A tracer of Cholesteryl hexadecyl ether (CHE) (26 μCi) was added to monitor lipid concentration. The lipids were dried down by rotary evaporation and then resuspended in ether (9 ml). 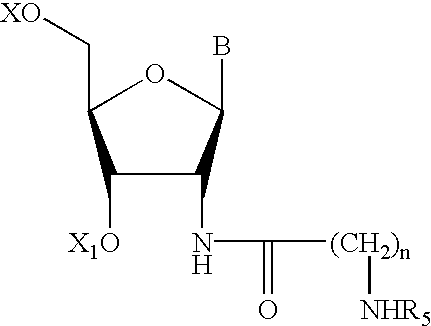 Ribozyme (25 mg) suspended in 1× phosphate buffered saline (3 ml) was added to the ether/lipid mixture and mixed together into an emulsion. The ribozyme was quantitated using a  32P internally labeled ribozyme tracer (160 μCi). Liposome vesicles were formed by removing the ether under vacuum. Residual ether was removed by bubbling argon gas through the lipid-ribozyme mixture for 10 minutes. Vesicles were then passed through polycarbonate filters with 200 nm and 100 nm pores consecutively 6-10 times using an Extruder ( Lipex Biomembranes, Vancouver, B. C.). Liposomes were purified from unencapsulated material using an FPLC column packed with DEAE sepharose CL-6B. Ribozyme and lipid concentration was determined by reading an aliquot of purified liposomes on a scintillation counter for both tritium and 32P. The counts indicated that 5.75 mg of ribozyme was present within liposome vesicles (23% encapsulation). Female C57B1/6J weighing 20-25 g were used in this study. with 3 mmol of lipid (36 mg ribozyme) by tail vein injection. The time points observed were 15 minutes, 1 hour, 4 hour, and 24 hours with 3 mice per group. The animals were euthanized by CO 2 asphyxiation. Upon cessation of breathing, the chest cavity was opened and blood sampled (200-500 μL) from the heart. Sampled blood was added to a heparinized microfuge tube and centrifuged for 10 minutes to separate plasma and blood cells. Plasma samples were treated with proteinase K containing buffer(100 mM NaCl, 10 mM tris (pH 8), 25mM EDTA, 10% SDS). A portion of the sample was to scintillant and counted. The remaining sample was resolved on a polyacrylamide gel and intact ribozyme bands were quantitated using a phosphorimager (molecular devices). The results are shown in FIG. 15. Formulation of ribozyme with EPC:CHOL:DSPE:PEG C18 greatly enhances the circulation time of intact ribozyme in plasma. Twenty-four hours after an intravenous bolus injection of 2 mg/kg ribozyme formulated with EPC:CHOL:DSPE:PEG2000, over 6% of the dose remained in the plasma. Average concentrations dropped from an average of 6631 ng/ml at 15 minutes to 2305 ng/ml at 24 hours. Since plasma concentrations were relatively high 24 hours after an injection, it can be assumed that the elimination half-life is on the order of hours if not days. In comparison, an intravenous bolus injection of 30 mg/kg is no longer detectable after approximately 3 hours. The elimination half-life of unformulated ribozyme is approximately 30 minutes in the mouse. The ability of cytofectins of the invention to transfect suspension cells was tested in Jurkat cells. These cells were grown and maintained in RPMI-1640 culture medium supplemented with 10% fetal bovine serum and glutamine (Life Technologies). The cells were diluted in culture medium to 5×10 5 cells/ml, and 80 μl (40,000 cells) was transferred into each well of a 96-well culture dish. A fluorescein-conjugated, nuclease resistant 23-mer oligonucleotide of randomized sequence was chemically synthesized for transfection. Additional oligonucleotides were synthesized using standard methodologies (Wincott et al., supra). The cytofectins identified using the delivery screen described in Example 23 were then used in efficacy assays. An antisense molecule directed against the mRNA for IMPDH, an essential enzyme involved in nucleic acid production, was formulated with the delivery vehicle and administered to Jurkat cells seeded in 96-well plates as described above. Assays were done in triplicate wells and cells were incubated for 24 h. A random sequence antisense molecule of the same length and containing the same type of linkages as the IMPDH binding antisense molecule was used as control. A quantitative Taqman assay (Perkin Elmer) was developed to measure the changes in IMPDH mRNA levels relative to actin, a constitutively expressed housekeeping gene. RNA from treated or untreated cells was extracted and then analyzed by Taqman. All three of the cytofectins tested were able to deliver sufficient antisense molecule to inhibit the expression of IMPDH-2 (FIGS. 16-18). Size: ˜150 to >1000 nucleotides. Requires a U in the target sequence immediately 5′ of the cleavage site. Binds 4-6 nucleotides at the 5′-side of the cleavage site. mutagenesis, and biochemical studies [,1]. Complete kinetic framework established for one ribozyme [2,3,4,5]. Studies of ribozyme folding and substrate docking underway [6,7,8]. Chemical modification investigation of important residues well established [9,10]. RNA portion of a ubiquitous ribonucleoprotein enzyme. Cleaves tRNA precursors to form mature tRNA . been sequenced from bacteria, yeast, rodents, and primates. Trans cleavage of target RNAs recently demonstrated [17,18]. OH and a “lariat” RNA containing a 3′-5′ and a 2′-5′ branch point. addition to RNA cleavage and ligation. Major structural features largely established through phylogenetic comparisons . Trans cleavage of hairpin target RNAs recently demonstrated . with 2′,3′-cyclic phosphate and 5′-OH ends. Binding sites and structural requirements not fully determined. Only 1 known member of this class. Found in Neurospora VS RNA. Requires the target sequence UH immediately 5′ of the cleavage site. use RNA as the infectious agent. Complete kinetic framework established for two or more ribozymes . Chemical modification investigation of important residues well established . Requires the target sequence GUC immediately 3′ of the cleavage site. side of the cleavage site. RNA as the infectious agent. Complete kinetic framework established for one ribozyme . Chemical modification investigation of important residues begun [36,37]. Trans cleavage of target RNAs demonstrated . of cleavage site are required. Folded ribozyme contains a pseudoknot structure . Only 2 known members of this class. Found in human HDV. DS46596a Arg-chol-2 1:0 nc99 5 1 punct. 1:1 nc25 5 2-3 punct. 2:1 nc26 5 2-3 punct. 3:1 nc27 5 2-4 punct. 1:1 nc4 5 4 punct. 2:1 nc5 5 1 punct. 3:1 nc6 5 1 punct. 1:1 nc13 5 0 bright punct. 2:1 nc14 5 0-1 bright punct. 3:1 nc15 5 0 bright punct. JA59311 Palmitoyl 1:0 nc101 5 0-1 some punct. 1:1 nc19 5 2 some punct. 2:1 nc20 5 1, faint punct. 3:1 nc21 5 3 bright punct. PH55938 Lys-chol. 1:0 nc104 5 0-1, few brt. no punct. AK52468 Beta-alanine 1:0 nc110 5 3, bright punct. 1:1 nc31 5 0 punct. 2:1 nc32 5 0-1 punct. 3:1 nc33 5 0-1 punct. AK52471 dipalmitoyl- 1:0 nc111 5 0 punct. 1:1 nc37 5 0 faint punct. PH55939 1:0 nc105 5 0-1 punct. 1:1 nc40 5 0 punct. 2:1 nc41 5 0-1 punct/vac. 3:1 nc42 5 0-1 punct. 1:1 nc43 5 0-1 punct. 2:1 nc44 5 0-1 heavy punct. PH55942 1:0 nc107 5 0-1 bright punct. 1:1 nc46 5 0-1 punct. 2:1 nc47 5 0-1 punct. 3:1 nc48 5 0-1 punct. JA59312 plamitoyl 1:0 nc102 5 1 bright punct. 1:1 nc49 5 3 punct. 2:1 nc50 5 3-4 bright punct. 3:1 nc51 5 4-5 bright punct. JA59314 1:0 nc103 5 0-1 punct. 1:1 nc52 5 0 punct. 2:1 nc53 5 0 punct. 3:1 nc54 5 0 faint punct. JA59316 palmityl- 1:0 nc97 5 0 heavy punct. 1:1 nc87 5 0 lt.
2:1 nc88 5 0 lt.
3:1 nc89 5 0 sticky/out. JA59317 palmity- 1:0 nc98 5 0-1 faint punct. 1:1 nc90 5 1-2 punct. 2:1 nc91 5 1-2 punct. 3:1 nc92 5 1 punct. nuclear delivery with no significant toxicity are shown. selected lipid formulations (Table II), as described (Methods). in GFP expression by ˜5% or more of the cells are indicated. cationic lipids after 4 hours in serum free media. wherein, n is 1, 2 or 3 carbon atoms; n1 is 2, 3, 4 or 5 carbon atoms; R and R1 independently represent C12-C22 alkyl chain which are saturated or unsaturated, wherein the unsaturation is represented by 1-4 double bonds; and Alk represents methyl, hydroxyalkyl or a combination thereof. wherein, R and R1 independently represent C12-C22 alkyl chain which are saturated or unsaturated, wherein the unsaturation is represented by 1-4 double bonds; and R2 is H, PEG, acyl or alkyl. wherein R3 is H, or PO3H2 and R4 is OH, NH2 or ═O. wherein, n is 1-6 carbon atoms; X and X1 independently represent C12-C22 alkyl chain which are saturated or unsaturated, wherein the unsaturation is represented by 1-4 double bonds; B is a nucleic acid base or H; and R5 is H, PEG, or carboxamidine. L1 is a linker represented by R7PO2, wherein R7 is H, CH3, or CH2CH3. 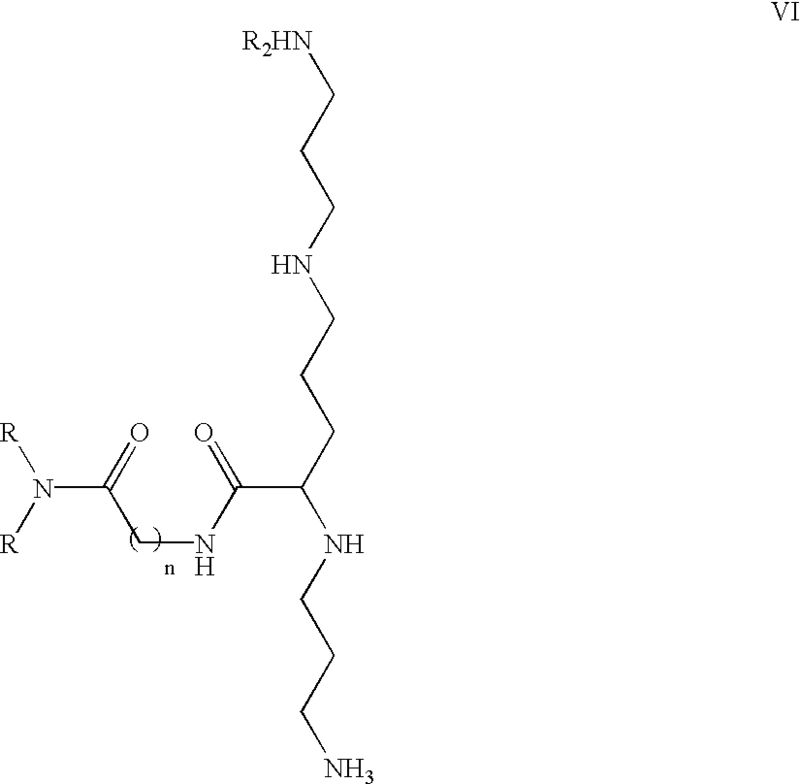 wherein, R8 is selected from the group consisting of arginyl, N-Boc arginyl, homoarginyl, N-Boc homoarginyl, ornithine, N-Boc ornithine, N-benzyl histidyl, lysyl, N-Boc lysyl, N-methyl arginyl, N-methyl guanidine, guanidine and pyridoxyl; and L2 is a linker represented by NH, glycine, N-butyldiamine or guanidine. 8. The cationic lipid of claim 1, wherein said cationic lipid is N′-palmityl-N′-oleyl-alpha, gamma-bis-trimethylammoniumbutyryl-glycinamide. 9. The cationic lipid of claim 2, wherein said cationic lipid is N′-palmityl-N′-oleyl-N-carboxamidine-glycinamide. 10. The cationic lipid of claim 2, wherein said cationic lipid is N′-palmityl-N′-oleyl-guanidine. 11. The cationic lipid of claim 7, wherein said cationic lipid is Boc arginine-cholesterylamide. 12. The cationic lipid of claim 6, wherein said cationic lipid is Cholesterol-Lysine-methyl ester-methylphosphonoamidate. 13. The cationic lipid of claim 6, wherein said cationic lipid is Cholesterol-methyl ester-homoarginine-methylphosphonoamidate. 14. The cationic lipid of claim 6, wherein said cationic lipid is Cholesterol-Lysine-amide-methylphosphonoamidate. 15. The cationic lipid of claim 6, wherein said cationic lipid is Cholesterol-TREN-methylphosphonoamidate. 16. The cationic lipid of claim 6, wherein said cationic lipid is Cholesterol-TREN-bis-guanidinium methylphosphonoamidate. 17. The cationic lipid of claim 6, wherein said cationic lipid is Cholesterol-histidine-methylphosphonoamidate. 18. The cationic lipid of claim 6, wherein said cationic lipid is Cholesterol-aminopropylimidazole-methylphosphonoamidate. 19. The cationic lipid of claim 3, wherein said cationic lipid is N′-palmityl-N′-oleyl-beta-alanine amide. 20. The cationic lipid of claim 3, wherein said cationic lipid is N′-palmityl-N′-oleyl-N-carboxamidine beta-alanine amide. 21. The cationic lipid of claim 3, wherein said cationic lipid is N(N′-palmityl-N′-oleyl-amidopropyl)pyridoxamine. 22. The cationic lipid of claim 7, wherein said cationic lipid is N-cholesteryl-pyridoxamine. 23. The cationic lipid of claim 7, wherein said cationic lipid is 3′,5′-Di-palmitoyl-2′-deoxy-2′-(N-carboxamidine-beta-alanineamido) uridine. 24. The cationic lipid of any of claims 1-7, wherein said cationic lipid ion-pairs to a negatively charged polymer selected from the group consisting of RNA, DNA, and protein. 25. The cationic lipid of claim 24, wherein said RNA and said DNA comprise one or more modifications. 26. The cationic lipid of claim 24, wherein said RNA is an enzymatic RNA. 27. The cationic lipid of claim 24, wherein said DNA is an enzymatic DNA. wherein R is independently C12-C22 alkyl chain which are saturated or unsaturated, wherein the unsaturation is represented by 1-4 double bonds; and R1 is selected from the group consisting of TREN, N,N′-di-carboxamidine TREN, lysyl, arginyl, omithyl, homoarginyl, histidyl, aminopropylimidazole, and spermine carboxylic acid. 29. The cationic lipid of claim 28, wherein said cationic lipid is N2,N3-di-oleyl-(N,N′-diguanidinoethyl-aminoethane)-2,3-diaminopropionic acid. 30. The cationic lipid of claim 4, wherein said cationic lipid is 3′,5′-Di-palmitoyl-2′-deoxy-2′(beta-alanineamido) uridine. 31. The cationic lipid of claim 4, wherein said cationic lipid is 3′,5′-Di-palmitoyl-2′-deoxy-2′(N-carboxamidine-beta-alanineamido) uridine. 32. 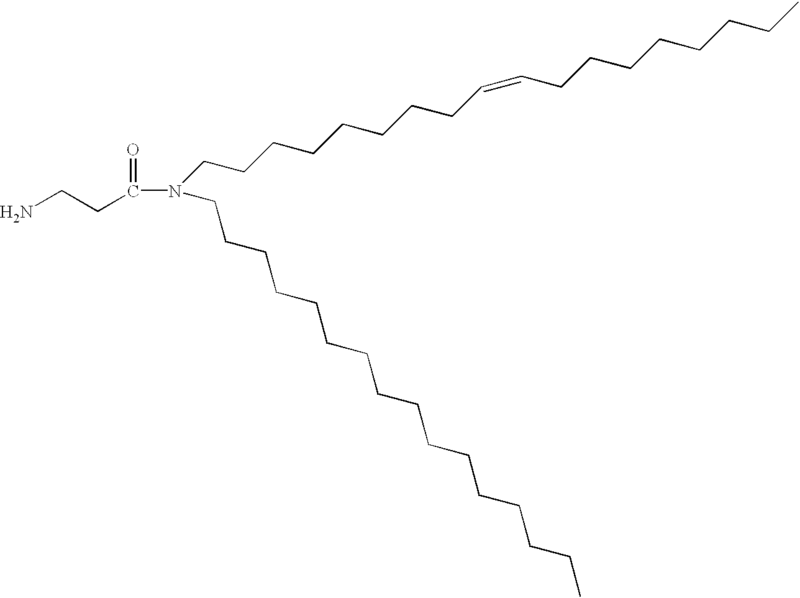 The cationic lipid of any of claims 1-7, wherein said cationic lipid is linked to polyethylene glycol (PEG). 33. The cationic lipid of claim 32, wherein said PEG is between about 2000-5000 daltons inclusive. ES2296419T3 (en) 2008-04-16 Transfection reagents. ES2208936T3 (en) 2004-06-16 Complexes Cationic lipids-nucleic acids.